Latest news from the team including product updates, tricks and tips, relevant industry news and other topics. Assigned users are now highlighted more distinctly via a small uniquely coloured tag featuring the users initials. To keep extremely busy calendars in shape we’ve also cut the amount of text that’s shown (wider screens see more) and reduced the number of items shown per day. If you want to see the full text for a particular item you can either click it or mouse over to view a tooltip. For days with a large number of events an indicator showing the number of additional tasks or appointments will be shown. You can click on this to expand the view revealing all the tasks for the day you are interested in. Another major change is how we work with tasks. Tasks are now more distinct from appointments in that they don’t require a due date, and are completable. 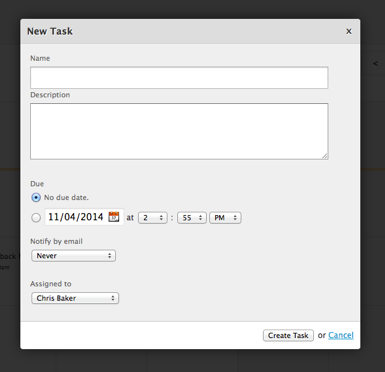 Your tasks will appear in a list to the right of the calendar, allowing you to tick them off as completed. Tasks that have a due date will also appear in the calendar and agenda. 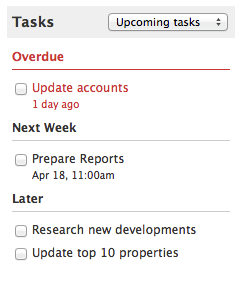 Overdue tasks will highlight as red and remain at the top of the list until they are completed. You can use these for things that don’t necessarily need to happen at an exact date or time and for keeping track of tasks you need to complete, ticking them off as you are done. Replacing the list view is a new Agenda which groups all the tasks by date and time giving you a much clearer picture of what is due to happen and when. The agenda also uses the colour coded display names for the assigned users so you can quickly and easily see who is assigned. 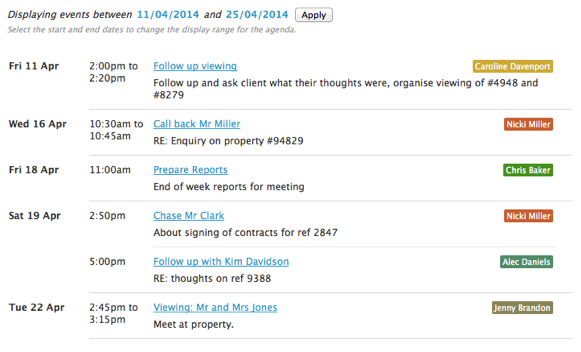 By default the Agenda shows the tasks and appointments coming up in the next 2 weeks. You have the added ability to redefine the date selection and also export the current view as CSV. To aid in quickly adding and editing tasks and appointments, we have added in place dialog boxes which appear as an overlay on your current page. 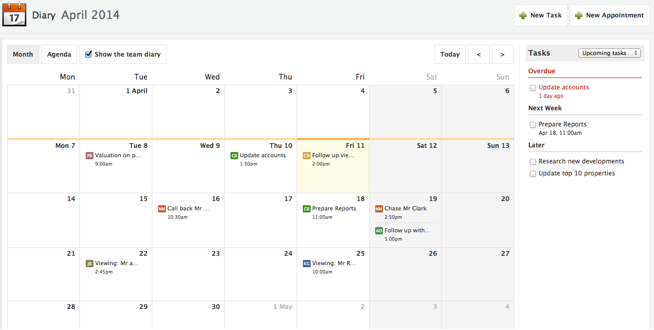 Clicking any item in the calendar will open it for editing/viewing details in a dialog. We have also swapped the date drop downs with a calendar for easier date selection and added an option to mark an appointment as "all day”. As with the current diary only users with the relevant user permission will be able to see entries for the entire team. Those with permission "view all” will be able to toggle between their own individual diary and the shared team diary. Those with only permission to view their own entries will not see this option.